providing medical services to the residents of Scugog Township. Dr. Merrilee Brown at home. 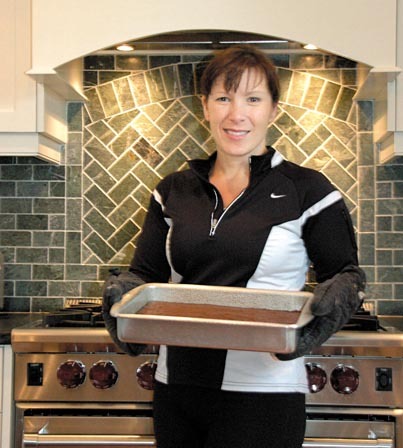 The smell of decadent chocolate fills the air of Dr. Merrilee Brown’s kitchen as she expertly works at mixing and stirring her homemade brownie batter. “Sorry, I’m just baking for my son’s violin recital tonight,” she explains, not the slightest-bit frazzled. Even with a demanding schedule that naturally comes from being a full-time wife, mother, family physician, medical teacher and an on-call emergency doctor, it is evident that Merrilee is completely in her element among all the chaos. But even on her days off, Merrilee is still Dr. Brown, which means she’s usually on route to check in on her patients or she’s preparing for her next teaching gig – she teaches medical teachers and trainees at both the University of Toronto and Queen’s University and regularly speaks at medical retreats. She also credits the team of Port Perry doctors and their unique camaraderie for making the everyday chaos bearable. “All of us doctors working together is the only thing that makes it sane,” she says, before adding that she and the other ‘docs’ consistently rely on one another to get the job done. Humour aside, Merrilee says she really did feel at home in Port Perry. “I remember thinking this is a wonderful town with great people.” But the old-town charm of Port Perry couldn’t compete with the power of love. Shortly after working the summer in Port Perry, she would follow her heart to Alberta to be with her husband. There in the small town of Stony Plain, which according to Merrilee “had the same agricultural flavour” as Port Perry, she would continue performing ‘locum tenens’ work for another year. She remembers one “quintessential Port Perry experience” which solidified, for her, the decision to come back to town. “One night I admitted a grandfather to the hospital and then delivered his grandchild within the same 24-hour period,” she says with a heart-warming smile. According to Merrilee the special connection she gets to establish with her patients and their families is just one of the many benefits of practicing in a small town. “You get to work with generations of families,” she adds. Since settling in town and starting her practice, Merrilee has realized that all the ‘Docs’ have their designated place within the medical community. “Every one of the doctors adds a piece to the puzzle, we have a broad skill-set of doctors here,” she explains. Merrilee has found her own niche in teaching. “I am heavily involved in medical education,” she says, referring to her position as co-chair of the Professional Development Committee for the University of Toronto Department of Family and Community Medicine and her role with the National Joint Committee on Rural Education. According to Dr. Brown, it’s the unique nature of the training here in Port Perry and the unique treatment the residents receive that makes the experience so noteworthy. Merrilee also insists that the tremendous support of her family, including her husband, Steve, her children, Alastair and Sophie, and her brother, Doug, is what allows her to take on all the work she does every day. Of Course, Merrilee says she can’t forget her brother, Doug, who has always been “very generous to the medical community.” She credits her brother for not only being the one to encourage her to come to Port Perry, but for also being there whenever she needs a hand.